The Gibson Assembly® method is a cloning technology that allows researchers to join DNA fragments, generating seamless constructs into any vector without the need for restriction sites in a single round of cloning. The principle of the Gibson Assembly® method relies on homologous overlap sequence designed into the fragments to be joined. Generating DNA fragments with these homologous regions is accomplished by PCR amplification or DNA synthesis prior to the assembly reaction. However, what if you have DNA fragments that do not have overlapping regions or cannot be easily amplified by PCR or synthesized? Can you still perform Gibson Assembly® cloning without adding homologous overlaps? Yes, you can. Instead of the standard Gibson Assembly® approach, you can simply use modified oligonucleotides and perform what is known as Gibson Assembly® Primer-Bridge End Joining™ (PBnJ™ Cloning). Our Gibson Assembly Cloning Guide introduces Gibson Assembly® PBnJ™ Cloning. With the PBnJ™ Cloning approach, researchers can easily clone DNA fragments without overlapping ends. Using simple modification steps, the Gibson Assembly® PBnJ™ Cloning method utilizes single primers or primer pairs with phosphorothioate-modified 3’ ends and the Gibson Assembly® cloning kits, which allows researchers to benefit from both the speed and efficiency of Gibson Assembly® cloning. What can I do with the Gibson Assembly® PBnJ™ method? How does the Gibson Assembly® PBnJ™ method work? 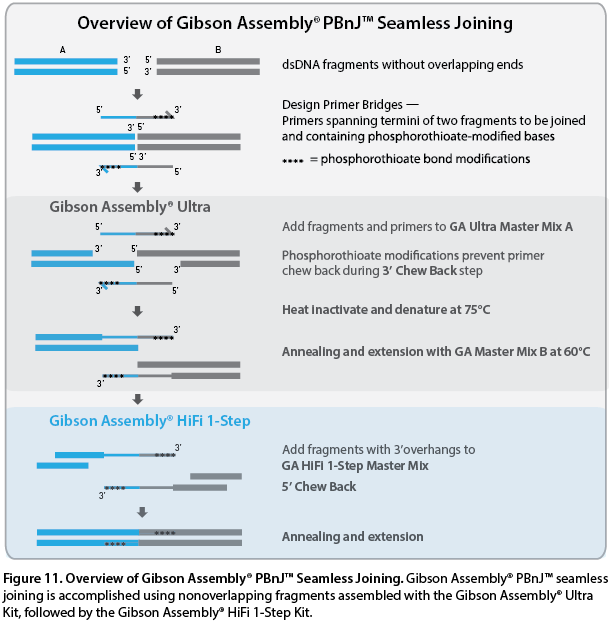 Gibson Assembly® PBnJ™ Cloning relies on the stepwise activities of the Gibson Assembly®Ultra Kit, followed by the Gibson Assembly®HiFi 1-Step Kit. For Gibson Assembly® PBnJ™ Cloning, instead of designing primers to generate homologous overlap regions, a primer pair is used to bridge two adjacent fragments. The primer pairs contain phosphorothioate-modified 3’ ends, which protect the primer from 3’ exonuclease chew back activity during assembly. After template chew back, the primers anneal to the nonoverlapping, single-stranded template sequence, which is later extended and ligated by the 5’ to 3’ polymerase activity of the GA HiFi 1-Step Master Mix. Gibson Assembly® PBnJ™ Cloning can also be adapted to create fragments with 3’overhang extensions or insertions between fragments. Look for more information about these variations next week. Special attention must be paid to the aim of particular corporate event venues San Francisco. If you are launching a new consumer product. Then the client has to be assured to buy the product by using some impressive ideas.